One of the top priorities identified in Pennsylvania and around the entire country is the growing demand of highly trained and skilled workers in the construction trades. 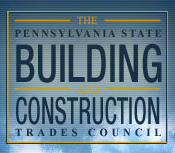 In order to promote training and recruitment into registered apprenticeship programs to meet these demands, the Pennsylvania State Building & Construction Trades Council promotes the use of Pre-Apprentice Training Programs, developed by the Building & Construction Trades Department Joint Apprenticeship Training Committee, in public and private schools. This will give many students the preparation they need to enter into the apprenticeship programs in the construction trades and help lower the high numbers of students that choose to drop out of school. Due to the increased cost of a college education, many students that graduate high school never plan on attending college. There may be no better reason to join a union other than the fact that union membersâ€™ wages are 28% higher than non-union workersâ€™ wages. It is not uncommon for non-union workers to earn $8 an hour, have no health insurance, and no pension. Public assistance programs funded by taxpayers make up for what employers should be paying, but are instead pocketing. Of course, corporations and private businesses have the fundamental right to make a profit….it is part of the American Dream. But some CEOs can earn 500 times the wages paid to their workers, and this greed is contributing to the demise of the middle class. Many non-union workers take for granted the rights and protections afforded to them by virtue of laborâ€™s struggles in the past. The 8-hour work day and 5-day work week are key examples. Additionally, in the ten states in which unions are the strongest, there is less poverty, higher household income, more education spending, and better public policy than in the ten states in which unions are the weakest.